You might have driven past a field of horses and noticed one horse squirming around on the ground with its legs flailing in the air. Or, after you unsaddle your horse and turn it into its paddock, it might lie down and scrub its back and sides on the ground. 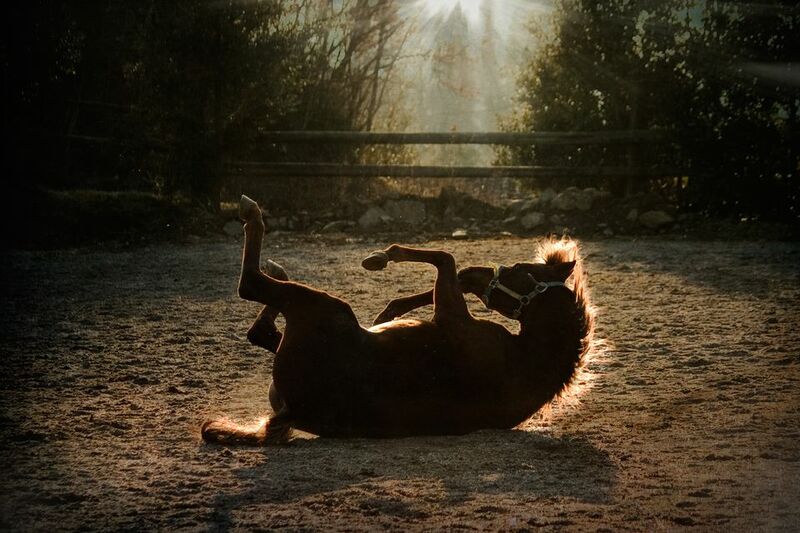 In either case, what you are seeing is a natural behavior of horses called rolling. There are a number of reasons why horses roll. After you ride your horse, it may get down in a sandy spot and have a good roll. This may relieve any irritation from sweat or tack, just as you might scratch after removing socks with elastics or pants with a snug waistband. Rolling may relieve any tight muscles or stress after being ridden. Horses will also roll to scratch themselves. If their skin itches from insect bites, residual shampoo or grooming products or from sweating in the sun or under a blanket, they will roll to stop the itch. Some people think that a roll in sand or mud provides some protection from sunburn and from biting insects. It's a bit frustrating if after you give your horse a good grooming or a bath, they find the closest patch of sand to roll in. But sometimes grooming and bathing can change how your horse's skin feels and rolling is its way of trying to get things back to normal. Often rolling will appear to be contagious. One horse will copy the behavior when they see another horse rolling. Rolling is a bit like the horse giving itself a massage. So, just because it feels good, one horse after another will share a sandy spot to roll in. It's not unusual to find a hollow bare circle in a field that is a favorite rolling spot. In the spring, when horses are shedding their thick winter coats, rolling helps loosen the hair. Horses may be damp with sweat if the temperature suddenly soars up, and your horse will be sweating beneath its warm coat. So rolling helps to relieve the itchy sweaty feeling while removing some of that excess hair. Rolling may also help dry the horse's skin, which is why it will do it after a rain or bath. Most of the time, rolling is perfectly okay, and a natural, healthy horse behavior. But there are a few situations where rolling might indicate a problem. You don't want your horse to try to roll while you are riding it. Horses attempt to roll while being ridden because they are uncomfortable, or rolling can be the horse's way of being balky, and resisting work. If your horse suddenly tries to roll while being ridden, carefully check your tack for anything that may be poking or pinching the horse. Your horse may also be experiencing muscle soreness while being ridden. Often, an equine chiropractor can help you sort out this sort of problem. And for horses that are balking, and using rolling to get out of work, some re-schooling with a rider who recognizes the signs that the horse may try to roll before the horse actually carries out the deed is in order. Rolling can also be a symptom of colic. You can identify a normal, healthy roll by noticing how the horse rolls, and how it acts when it gets on its feet. When your horse is rolling for the enjoyment of it, it may circle around a few times, get down, roll, perhaps get up again and roll on the other side, regain its feet and then have a good shake to get the dust off. And healthy horses rarely try to roll in their stall. When a horse is rolling because of colic, it will drop down, often suddenly, roll violently, and then stand listlessly afterward, with no invigorating shake to rid itself of dust. It may try to roll in its stall, and it may try to roll multiple times. A horse that has been rolling in its stall may appear disheveled, sweaty and covered in manure and shavings. There's some debate whether rolling can cause twists in the gut that cause torsion colic. Some people feel that a twist has occurred before the horse starts to show colic symptoms, such as rolling. But, whether or not rolling causes twists, a horse with colic torsion should be prevented from rolling because it expends a lot of energy, and as it violently thrashes, could hurt itself or the people handling it.